Most folks don't pay much attention to such trivial things as boiling a pot of water. But since you're on the road to some serious distillation, it always helps to know what's really going on when you do that. In fact, the subject of boiling water is serious enough to some people that they have devoted web pages to the subject just to help others understand the process. Wayne Pafko covers this well in his "History of Chemical Engineering" site at: http://www.pafko.com/history/index.html To save you the inconvenience of having to interrupt this section he has courteously provided the following two graphs from his site. This is a graph of how the temperature varied when you ran the initial still shakedown. The tap water started out near room temperature at point "A" in the boiler, and as heat was applied the water temperature rose at a constant rate until it reached the boiling point at "C" about 8 minutes later. If you got to the point of doing the initial test run you probably noticed that the column thermometer on the still was not of much use during this run. It missed the warm up, and sat at room temperature until the steam moved up the column and reached it. Only then did it begin to show the vapor temperature. Then, somewhat strangely, the temperature didn't change throughout the whole distillation even though the heater was still pouring energy into the pot all during that time..
Makes you wonder why the still has a thermometer on it. Fact is, the only useful information we got from it during the initial run was an indication of when the water was boiling and what the temperature of the steam that was produced. Surely, we don't need an expensive thermometer for just that! But there is a good reason to have it there. In the shakedown run we dealt with only one component in the still,. Things change when you deal with a mixture of things in the pot. When you blend two liquids of different boiling points together, the resulting mixture usually boils at a different temperature than either of the components. Also, depending on some of the other physical characteristics of the components in the mixture, you will notice a difference in how long it takes to heat the mixture to it's boiling point. Finally, you'll find that once boiling, the temperature of the vapors that are boiled off gradually increase as you continue the boil. 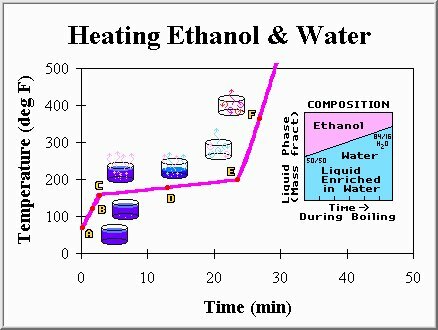 All of these effects are shown in the graph above which shows how the temperature changes over time when an ethanol/water mixture is boiled. Notice that the mixture heats up to boiling in less than five minutes (it took the water about 8), but the boiling temperature is only about 170° F (the water boiled at 212° F). Notice also, that once boiling, the temperature rises gradually over the next 20 minutes until all the mixture is evaporated (point E). You'll see this kind of temperature behavior if you ever decide to distill alcohol. It's best understood by looking at the little side graph above which shows how the concentrations of water and ethanol in the vapors vary during the distillation process. The mixture starts out with about 50% water and 50% ethanol, but the alcohol in the mixture boils at a lower temperature than the water, and evaporates more quickly. Consequently, as the boiling continues, the vapor contains less and less alcohol and more and more water. This accounts for the gradual rise in the vapor temperature, because toward the end there is much more water than alcohol, and it takes a higher temperature to vaporize the water. That's the primary reason for the still to have a thermometer mounted at the top of the column. It lets you monitor the vapor temperature as you distill. In turn, this lets you judge the purity of the distillate output without having to measure it with a hydrometer. In a batch distillation, the thermometer becomes a very useful tool to indicate when to begin collecting the distillate, and when to cut it off. This is your first step in optimizing your distillation. If you are distilling alcohol you most likely will be working with a beer made by fermenting some sort of sugar based mash. If you intend to use the distillate as a beverage, then there are a couple of other considerations you'll need to deal with during the distillation. Some of these compounds play a part in judging the quality of the spirits that goes far beyond the concentrations shown in the table. That's because the human senses of taste and smell are far more acute in many cases than the analytical techniques used to express their concentrations in the liquor. One of the more widely known groups in the table is the higher alcohols, sometimes called fusel oils. In general, the compounds in this group are a mixture of volatile, oily liquids with a disagreeable odor and taste. Before industrial production of synthetic amyl alcohols began in the 1920s, fusel oil was the only commercial source of these compounds, which are major ingredients in the production of lacquer thinner. Not surprisingly, in the beverage industry, congeners and fusel oils are ordinarily allowed to remain in the finished distillation products. They are the major ingredients that differentiate brand name whiskeys by taste. In many circles, the mark of a poorly distilled spirit is a colossal hangover. That malady can be avoided by producing a highly refined spirit, but usually at the sacrifice of some of the characteristic tastes associated with the drink. The choice of how you handle this issue is really up to you. Whenever you distill something, the most volatile products come out first. So when you distill a mash, the low boiling point compounds in it (in general the Nitrogenous Substances, Aldehydes, and Esters) will appear in the first distillate. This part of the distillation is commonly called the "Heads". You can prevent them from contaminating the product you are attempting to separate by watching the temperature and discarding (or saving for addition to the next batch) everything that boils off before you reach the boiling point of the target component. But, depending on the nature of the wash, it's sometimes difficult to isolate the heads by simply monitoring the temperature. It's easy to miss the boiling points of those compounds that vaporize below 70° C when there is an excess of heat input, and the vapors rise up the column quickly to reach the thermometer bulb. Many experienced distillers carefully monitor the taste and smell of the first distillate from the still to insure that all the heads are boiled off before they begin the collection of the body of the spirits. Others simply discard a small (e.g.150 ml) fixed amount, before beginning the collection of the ethanol. A similar distillation cutoff point is also encountered as the ethanol nears depletion from the distillation. This phase is commonly referred to as the "Tails". The tails contain an increased amount of the higher boiling point compounds, such as the higher alcohols and furfurol. These compounds can also spoil the taste of the spirits if the collection is carried on too long. A cutoff similar to that of the heads should be made. Again this point can be recognized by monitoring either the temperature or the taste and smell of the distillate. Many distillers simply limit the collection of the pure spirits to a narrow range of temperatures (e.g. 78.3 - 80 C), and then make the cut. Others sample the specific gravity of the distillate as it nears the end of the run. Still others use the smell and taste indicators. In any event, there usually is considerable ethanol that can be recovered from that remaining after the tails have been cut. Commonly, the tail collection is saved for inclusion in the next batch. As mentioned previously, the most important factor in achieving a high degree of purity in the distillation is the amount of reflux that is employed. When you use this still, you should allow only a small part of the distillate output to be withdrawn in a unit of time, and let the rest be re-cycled back into the column. That's a rather simple way to control the amount of refluxing. The proportion of distillate returned to the column versus that which is withdrawn is called the Reflux Ratio. In theory, the more reflux cycles that are allowed to take place the purer the output will be. In other words, high reflux ratios produce more refined products. In practice though, you will find that as you increase the reflux ratio more and more, it produces less and less improvement in both the purity and the amount of the output. You soon reach the point where the whole operation becomes counter productive in terms of the time and heating costs needed to produce the distillate. It’s also important to recognize that no matter how many reflux cycles are applied to the process, you will never be able to get a completely pure distillate. Under the circumstances then, a practical goal should be to produce a purer product than what you can buy commercially, and at the same time produce the product at the least cost. "What is the best reflux ratio to use in my still, and how do I regulate it ?" Like the question, there are at least two answers. This type of still controls the reflux ratio by regulating the cooling flow through the tubes that pass through the inside the column. We estimate the reflux ratio by measuring the maximum distillation rate at a given heat level with minimal cooling, and then regulate the cooling to provide an appropriate fraction of that rate. Suppose, for instance, you can distill 1 liter/hour at a given heat setting with minimal cooling, and you want a reflux ratio of 3 to 1. Then you simply adjust the cooling flow (without changing the heat) to the point where only 250ml of output is distilled in one hour. That means for each 1000 ml of distillate passed in a unit of time, 250ml is withdrawn, and 750 ml is refluxed. That gives a reflux ratio of 3:1. Coming back to the key question "What’s the best reflux ratio to use?" Unfortunately, that also depends on the column design, what's being distilled, an assessment of the output purity, and an evaluation of the costs involved in producing that purity. It will take some experimentation on your part to get exactly what you want. If you want to distill ethyl alcohol for instance, your best bet would be to start with a reflux ratio of about 3:1 with this still. Commercial operations, I’ve been told, use ratios ranging from 1.8:1 to 5:1 for distilling this product. Under normal conditions then, and using this ratio, you should be able to produce about 5 liters of crystal clear, totally odorless, 190 proof spirit from a 20% beer in a about 6 hours of distillation. The good part of tuning this still is that you have complete control over the refluxing. That also means you can make it behave exactly as you want. It's a lot easier to control the reflux ratio with this type of still because it has separate valves to regulate how much distillate is returned to the column, and how much is withdrawn as a product output. In turn, that allows you to set up and measure the maximum distillation rate by simply shutting off the reflux flow with a needle valve and then measuring how much output flows from the still in a unit of time. Once you know the maximum output, it becomes an easy matter to throttle that back with the reflux valve fully open. The difference between the max output rate and the observed output rate will be the reflux rate. And because of the dual valves, there is a great number of combination settings you may select once the max flow is known to either decrease or increase either of the flows without losing sight of a proper reflux ratio. But the bottom line is that, like the internal reflux still, you will have to experiment to get the best product. Ethanol Equilibrium Graph Used in Distillation Column Optimization.